I haven’t been shaping surfboards for very long in the grand scheme of things. It’s only been 2 1/2 years, and in that time I have finished 7 boards. Numbers 8, 9, 10 and 11 are now also locked in, so I’ll have a busy few months ahead of me if I can just get that bathroom cabinet project out of the way (it’s taking up all the room in my shed at the moment). But through all that time, I have been very conscious of the fact that the materials I work with to craft these boards are all petro-chemical based, highly toxic and, ultimately, quite damaging to the earth if you follow the chain of production through from extraction to the final manufacturing and shipping phases. So what can I do, now that I have a handle on (but have by no means mastered) the shaping process? It’s time to rethink the materials. 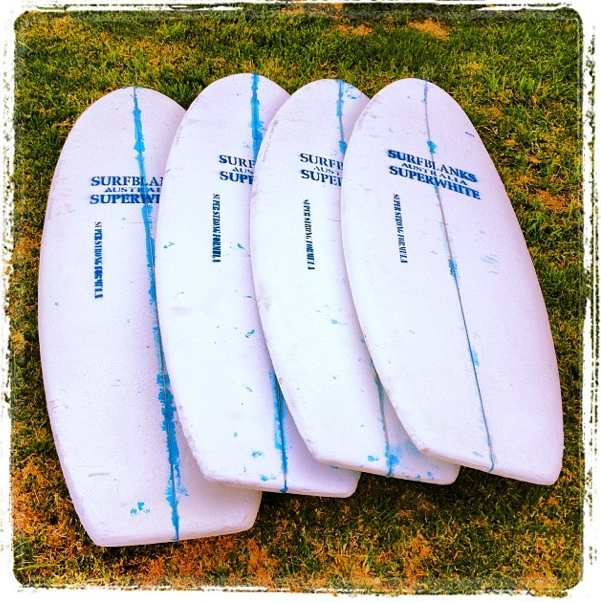 All a-quiver, but what are the environmental implications of using these materials? Now, since I started shaping, I’ve been an avid consumer of the encyclopaedic volumes of shaping information, knowledge and experience that is available via Swaylock’s. 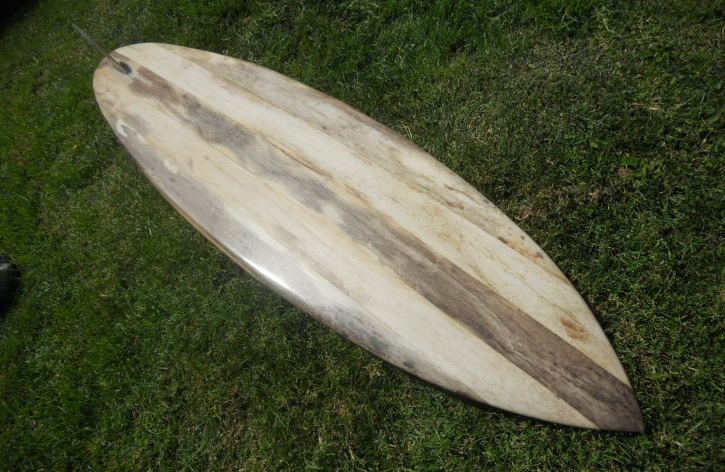 Anyone who wants to shape a surfboard of any description should spend at least a week trawling through the site’s archives. The inhabitants can be a bit abrasive and do not suffer fools lightly, but if you have patience, a thick skin and some free time, I highly recommend signing up and plugging in. It’s a great resource and I doubt I would have progressed nearly as quickly as I have without it. But back to the materials. One discussion topic in particular has caught my eye over the past year or so of Swaylocking – Agave. Basically, it’s a giant succulent that has leaves tipped with thorns as long as my little finger, which is native to the deserts of Mexico, south-western USA and Central and South America. One of the Agave cousins, Agave tequilana, is (as the name suggests) used in the manufacture of tequila, which already had me favourably disposed towards the family. But it is the Agave americana that I am particularly interested in. This plant, once established, sends up a large inflorescence from the centre of the sabre-patch of the main plant. This stalk, which can tower anywhere up to five or six metres and has a considerable girth, is made of a fibrous material – tough yet flexible and surprisingly light. When you compare this material’s weight:volume when it’s dry, it’s not that much heavier than your standard polyurethane foam and can be worked in a similar fashion. 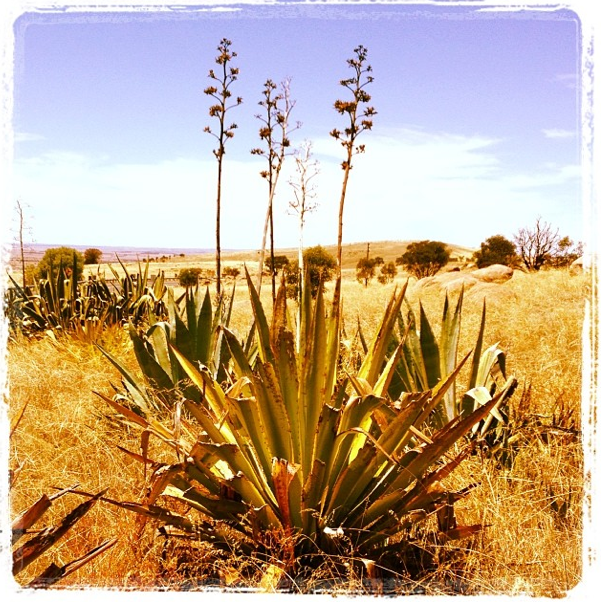 As it turns out, Agave americana was a popular choice for homestead gardens amongst early european settlers in the more arid regions of South Australia. Its ability to withstand both neglect and low rainfall conditions means that it’s well-suited to the driest state on the driest continent on earth. With this in mind, I went for a drive last week, heading down into the rainshadow that extends east from the Adelaide Hills towards the Murray River and beyond. This is marginal country, where only sheep and granite grow with any conviction, dotted here and there with the ruined remains of the early settlers’ optimistic, but ultimately doomed endeavours. Sure enough, as the road wound down through a steep eroded gully towards the river flats, I discovered a patch of agave that covered almost half an acre. I pulled the car over, grabbed a saw and gloves (essential) from the back of the car and leapt the double strand of barbed wire that separated public land from private. The patch had numerous flower stalks in various stages of maturity, from just emerging, to dead, dessicated and cracking in the searing summer heat. 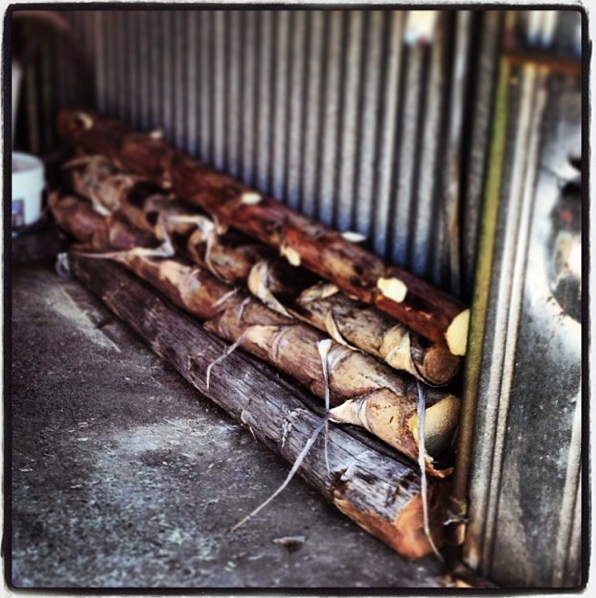 Conscious that I was trespassing in country where interlopers are not particularly welcome (master of the understatement), I set about selecting and felling as many logs of an appropriate size in as short a time as possible. In about 15 minutes I had four 6-foot lengths cut and loaded into the back of the Subaru. I would have collected more, but the music from Deliverance, which had been playing quietly in the back of my mind since I began this venture, had started to increase in volume. I thought it safer to hedge my bets and get gone while the getting was still good. Given the manufacturing process, four stalks is about half as many as I’ll need for a full board. This means I’ll have to go out again sometime soon and collect the other half. I’ve spoken to a couple of friends, who have told me of other patches just waiting to be raided, so once I’ve regathered my courage and recovered from the agave spike that stuck almost an inch into the side of my right knee, I’ll go out once more with saw and gloves and get the rest of what I need. Needless to say, I will document the shaping process with photos and words right here, so watch this space.